Ephesus is probably the most impressive archeolo-gical site in Turkey. It must have been colonized by the Greeks not later than the tenth century B.C. although Lydians and Carians occupied the site earlier. The Greeks brought their own goddess, Artemis, with them to Ephesus. (The statues of her in the museums in Selçuk and İzmir are second century A.D. representations. ) For over a thousand years this goddess with her temple provided a focal point for the rich religious, economic, and cultural life of her worshippers. Now, as the visitor sees, hardly one stone remains of one of the most famous architectural creations of man, the Temple of Artemis in Ephesus. Built on marshy ground not far from the Cayster (Küçük Menderes) River, it arose on a site occupied from time to time by several temples of which at least one dates from pre-Greek days. It faced west, toward the sea and the setting sun. Pliny the Younger tells us that the columns in front of the temple were carved with notable events in the life of the Greeks and that the statue of Artemis stood in the inner sanctuary. This temple was the first in the world to be constructed entirely of marble. Ephesus must have been a beautiful city in its time. The usual approach was from the west, from the sea. A visitor, arriving on a trireme loaded with cargo, slaves, and pilgrims bringing gifts to Artemis, must have been overwhelmed by the first view of her temple. As pilgrims approached from the west and moved their eyes to the right of the temple they would have seen the great theater on the slopes of Mt. Pion (Panayır Dağı) standing out in the brilliant Aegean sun. Even today, as the theater is being partially restored, one can almost hear the toga-clad audience cheering some hero on the stage or perhaps screaming against St.Paul. To the north of the theater one can see a decorated arch, the entrance to tho stadium. A wide marble-paved street called Arcadiane or the Arcadian Way stretches from the base of the theater several hundred meters to the harbor. It was lined with statues, porticos, and public buildings, one of which may have been the lecture hall of Tyrar.’nus where Paul held daily discussions (Acts 19:9). Just north of the Arcadian Way is the Church of the Virgin Mary or the Double Church. Another marble street stretches from the theater south to the Library of Celsus where thousands of parchments and papyri were stored, protected from dampness and worms by a double wall, but not from earthquake or war. Moving to the west of the library along the edge of the Hellenistic agora one may climb stairs and reach the tumbled columns (each weighing eighty tons) and the exquisite decorations of the temple of Serapis, a composite Egyptian deity. Great drums of the eight marble columns supporting the architrave, each nearly a meter and a half in diameter, their capitals and entablature carved with the intricate acanthus leaves and universal egg and dart patterns, lie in front of the temple. Returning to the library from the temple one continues up the long paved street toward the east, past the recently uncovered Temple of Hadrian, and on to the odeum, the little theater that is thought to have been covered with a roof because there is no provision for the rain water to be carried away. It held about 2,200 spectators. 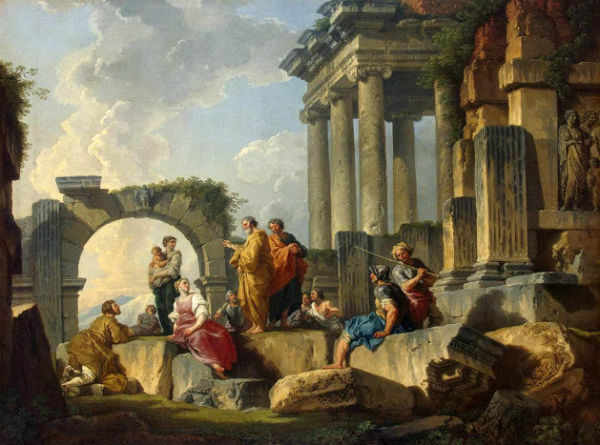 Here musicians played their flutes, lyres, and citharas, and poets recited from Homer and Hesiod. Not far in front of the odeum is the foundation of what is thought to have been a temple that was later made into a church. A bull’s head carved in the door-jamb once led people to believe this was the Tomb of St. Luke since the bull’s head was an ancient symbol for him. When Paul was returning from Corinth to Ephesus he brought Priscilla and Aquila with him. Here he stayed briefly, talked in the synagogue where he was asked to stay longer, and promised, “I shall come back to you if it is God’s will” (Acts 18:18-20). And so he left Ephesus for Caesarea and Jerusalem, completing that second journey. On his third journey he found several others engaged in evangelism in Ephesus. Two of them were his earlier friends, Priscilla (often called Prisca) and Aquila. We are told in Acts 18:2-4 that Aquila was a Jew born in the province of Pontus. Priscilla and Aquila had emigrated to Rome, but with all other Jews they were forced to leave the city under an edict of the emperor Claudius and they settled in Corinth where Paul met them when he visited that city. Aquila’s trade was that of a tentmaker. Since this was also Paul’s trade they became acquainted and Paul lived with them in Corinth (Acts 18:3). They no doubt had met each other in the synagogue. Paul was able to continue speaking in the synagogue in Ephesus for three months before he withdrew his disciples and went to the lecture hall of Tyrannus. According to one reading, Paul taught from the fifth to the tenth hour, that is, from eleven to four, during the hottest hours of the day when the hall was empty. This he did every day for two years. The troubles that Paul encountered in Ephesus are scantily told by Luke, but the riot in Ephesus is one vivid example of how business interests can combine with religious faith to try to prevent change. The sale of silver images of the-temple and of Artemis declined when Paul preached that “gods made by human hands are not gods at all” (Acts 19:26). So Demetrius, a leader of the silversmiths, told a group of tradesmen that not only would a lot of people be out of work, but “the sanctuary of the great goddess Diana will cease to command respect; and then it will not be long before she who is worshipped by all Asia and the civilized world is brought down from her divine preeminence” (Acts 19:27). Demetrius was right, but he was on the wrong side of history to be counted a Christian prophet. His speech caused an uproar in the city and the mob rushed into the great theater shouting, “Great is Diana of the Ephesians” for about two hours. The city clerk was called in to tell the crowd that it had legal recourse through the court for redress of injuries if the missionaries had done anything wrong, but that the rioters were in danger of prosecution if they continued. By then most of the people in the theater did not know why they had come in the first place. So the clerk dismissed the meeting and the city calmed down. However it was apparent to Paul that he had better leave. Calling the believers together, he said goodbye to them with words of encouragement and set off for Macedonia (Acts 19:28-20:1). The entire sixteenth chapter of Romans, which is a series of personal greetings, is probably a note to a Christian congregation in Ephesus that somehow became attached to that book. The third verse of this series is a greeting to Prisca and Aquila who “risked their necks to save my life” (Rom. 16:3). In I Corinthians 15:32 Paul writes, “If, as the saying is, I ‘fought wild beasts’ at Ephesus, what have I gained by it?” The beasts may have been human or they may have been lions from which, perhaps with the aid of Prisca and Aquila, he mercifully escaped. Paul’s second letter to the Corinthians from Ephesus (probably written in the same year as the first) reinforces a sense of frustration that one does not find in Acts: “…We should like you to know, dear friends, how serious was the trouble that came upon us in the province of Asia. The burden of it was far too heavy for us to bear, so heavy that we even despaired of life” (II Cor. 1:8). How much of the suffering and persecution mentioned in other portions of II Corinthians (6:4-10, 11:23-27) occured in Ephesus we do not know. In Romans 16:7 there is a word of greeting to “Andronicus and Junias my fellow-countrymen and comrades in captivity.” This strengthens the evidence that Paul was Imprisoned in Ephesus. Many scholars now believe that it was during an Ephesian imprisonment that Paul wrote Philippians, and perhaps also other letters now In the New Testament. A mute reminder of Paul’s possible imprisonment there Is a solid stone building sitting on a hill about one kilometer west of the theater and known today as St. Paul’s Prison. Ayio Theologo which was transformed in common parlance through Ayo-tholögo and Ayosoluk to a word meaningful to its present Turkish residents, Selcuk. This name is in keeping with the Byzantine tradition of calling a town according to its most important church. Here it was that of St. John Theologus, but that name in itself does not prove that he lived there. Ayasoluk was the name by which the town was known well into the present century. An early memorial connected with John’s supposed grave was later enclosed in a small church. Under the Byzantine Emperor Justinian, the church became a cathedral. Some of its fallen columns have been set up again recently. Besides the nave there is a baptistery and a small chapel with some frescoes. Paul was a busy missionary…while in Ephesus, he gave daily talks in the lecture hall of Tyranus about the gospel of Jesus Christ. He gave direction and counsel to church leaders and healed the sick. Another tradition, especially among Catholics, is that John brought Mary, the mother of Jesus, to Ephesus and that she lived out her days on a hilltop south of the city. Tradition is in itself sufficient evidence for a person who finds religious comfort in believing that she actually came here to live. But there is no direct evidence in the Bible. The assumption is that the disciple John was the disciple whom Jesus loved, and that he was also the author of the Gospel According to John which is traditionally associated with Ephesus. The conflicting tradition is that John was martyred in 44. A.D. and that Mary died on Mount Zion in Jerusalem where the Church of the Dormltion now stands. 1967 Pope Paul VI celebrated mass here, and also prayed in the Double Church, the Church of St. Mary, in Ephesus itself. In Revelation John claimed that he had a vision in which “one like a son of man” who is the first and last and living one commanded him to write “to the angel of the church at Ephesus” (Rev. 1:13-19, 2:1). To that church the words came from “the One who holds the seven stars in his right hand and walks among the seven lamps of gold” (Rev. 2:1). The burden of the letter was that the Ephesians had cooled in their faith: “you have lost your early love” (Rev. 2:4). These words were a reminder of the days of Paul a generation before when the first converts to faith in Christ were intense in their belief. “Fortitude you have,” he said. But “think from what a height you have fallen; repent, and do as you once did” (Rev. 2:3, 5). He commended them for not compromising their beliefs as the Nicolatians did. For those who are faithful, John held out this promise: “To him who is victorious I will give the right to eat from the tree of life that stands in the Garden of God” (Rev. 2:7). This promise John made in the name of the Spirit of his vision and of Christ. Acts 19:1-22 – While Apollos was in Corinth Paul journeyed through the upper parts of the country (the high inland plateau of Asia Minor) and arrived at Ephesus  (on the coast). There he discovered some disciples, and he asked them, …. “Well then, how were you baptised?” asked Paul. “We were baptised with John (the Baptist)‘s baptism,” they replied. Then Paul made his way into the synagogue there and for three months he spoke with the utmost confidence, using both argument and persuasion as he talked of the kingdom of God. But when some of them hardened in their attitude towards the message and refused to believe it, and, what is more, spoke offensively about the Way (of Jesus Christ) in public, Paul left them, and withdrew his disciples, and held daily discussions in the lecture-hall of Tyrannus (a philosopher or teacher in Ephesus). He continued this practice for two years (… Paul’s longest recorded stay in any one location during his three Missionary Journeys), so that all who lived in Asia (not just Ephesus, but the surrounding country), both Greeks and Jews, could hear the Lord’s message. God gave most unusual demonstrations of power through Paul’s hands, so much so that people took to the sick any handkerchiefs or small-clothes which had been in contact with his body, and they were cured of their diseases and their evil spirits left them. But there were some itinerant Jewish exorcists who attempted to invoke the name of the Lord Jesus when dealing with those who had evil spirits. They would say, “I command you in the name of Jesus whom Paul preaches.” Seven brothers, sons of a chief priest called Sceva, were engaged in this practice on one occasion, when the evil spirit answered, “Jesus I know, and I am acquainted with Paul, but who on earth are you?” And the man in whom the evil spirit was living sprang at them and over-powered them all with such violence that they rushed out of that house wounded, with their clothes torn off their backs. This incident became known to all the Jews and Greeks who were living in Ephesus, and a great sense of awe came over them all, while the name of the Lord Jesus became highly respected. Many of those who had professed their faith began openly to admit their former practices. A number of those who had previously practised magic collected their books and burned them publicly. (They estimated the value of these books and found it to be no less than five thousand pounds –50,000 drachma, a drachma being a day’s wage; say £2-3 million sterling!) In this way the Word of the Lord continued to grow irresistibly in power and influence. Then he despatched to Macedonia (the province that included the cities of Philippi and Thessalonica) two of his assistants, Timothy and Erastus, while he himself stayed for a while in Asia. At the end of Paul’s two years in Ephesus, an anti-Christian riot takes place. A man named Demetrius, who is a maker of silver shrines, is the instigator. Calling a meeting of shrine makers, he points out that they are losing business because so many people are converting to Christianity.